Public CoLab 2018 tackled the negative connotations associated with the River Foyle, in Derry/Londonderry, and brought vibrancy, vitality and passive surveillance to the hitherto underutilised riverfront. It achieved this through the creation of five temporary interactive installations, which were designed and constructed by 86 architecture students from QUB in collaboration with a riverfront regeneration initiative called Our Future Foyle. Public CoLab presented these budding architects with a unique opportunity to addressed a real issue of public concern in Northern Ireland and, also, to see their ideas come to fruition. The Stage One undergraduate students worked in teams of four and in conversation with Our Future Foyle, the local digital fabrication laboratory and the teaching team to develop initial proposals. Following on from the sketch design phase, each team was joined by three Master’s students who, through the intensive five-day workshop, helped to develop the designs through the construction of scaled laser cut prototypes and a set of fabrication drawings. On the final day of the project, the outcomes were presented to Our Future Foyle. They had initially agreed to realize four of the designs in full scale and in-situ. However, after seeing the quality and ingenuity of the students’ proposals, they decided to invest in the building of five of the most impactful designs. 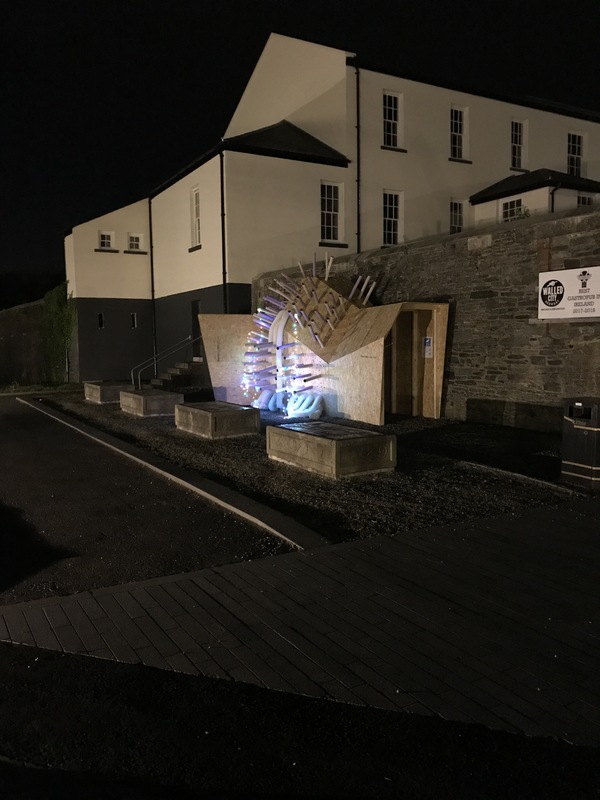 These installations were showcased on the banks of the River Foyle in late May 2018 as part of the public space design festival where 14,000 passers-by interacted with the student’s creations. Public CoLab 2018 was led by Dr. Nuala Flood in collaboration with Dr. Sarah Lappin, Dr. Jasna Mariotti and Dr. Niek Turner. It was the recipient of a QUB team teaching award in June 2018.